A new and AV-improved Big Tex was back welcoming guests to the State Fair of Texas this past October with the help of SRO Associates and Texas Scenic and the implementation of Alcorn McBride’s V4 Pro frame-accurate controller and AM4 Digital Audio Machine. 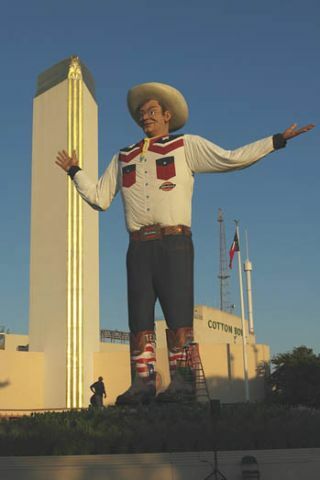 The iconic giant cowboy had been greeting fairgoers since 1952 when it was destroyed by fire near the end of the fall 2012 State Fair. The rebuilt Big Tex was bigger and better than ever tipping the scales at 25,000 pounds and towering over the fairgrounds at 55 feet tall. He boasted a new red, white and blue outfit and boots decorated with the Texas and American flags, the State Capitol, bluebonnets, longhorns and other Lone Star State imagery. Big Tex was no static figure. He waved his hand, turned his head and spoke pointing guests to The Million Dollar Midway and the Texas-size fun and wonders that awaited them. Over a period of 10 months SRO Associates designed and built the shape and visible parts of Big Tex at its studios in Boerne, Texas and partnered with Texas Scenic in San Antonio to engineer the structure and design the mechanisms that make the giant cowboy come to life. Big Tex’s moving mouth had to function with the live voice of the giant cowboy as well as with prerecorded audio. “With the prerecorded audio we originally planned to do a timeline of mouth movements to audio. When we decided to actually interface with audio we had to come up with a system to make it more dynamic,” says Bohn. Alcorn McBride engineer Joy Burke says the V4 Pro served as the show controller for Big Tex, starting and stopping his performance via the Showtouch software interface from a touch panel. “The V4 Pro is a very reliable system, rock solid with no chance of downtime. It easily interfaced with the complex systems involved in this show and communicated with the MOVI-PLC as well as the AM4 audio player,” she says. Specifically, the V4 Pro sent the MOVI-PLC “appropriate commands and toggle bits to allow it to follow the audio file and tell the PLC when to move Big Tex’s mouth up and down,” Burke explains. The V4 Pro triggered prerecorded audio tracks with a timeline and audio tailored to particular times of day by reading the audio values and sending commands as needed. For live audio, when the voice of Big Tex used the microphone the V4 Pro made the figure’s mouth movements coincide.